Nagaland governor PB Acharya and Chief Minister Neiphiu Rio led the state in attending former Prime Minister Atal Bihari Vajpayee’s funeral in New Delhion Friday. All government offices, educational institutions, both government and private, remained closed on the day as a mark of respect to the departed leader. However, businesses ran as usual across the state. The state government also announced seven-day state mourning fromThursdaytoAugust 22as a mark of respect for the former Prime Minister. The national flag was flown at half mast fromFriday. The government said there would be no official entertainment during the period of the state mourning. In 2003, Vajpayee travelled by road from Dimapur airport to Kohima as inclement weather did not allow him fly by helicopter and forced his entourage to take the only road that barely existed. The then Chief Minister Neiphiu Rio referred this gesture as a sign of “concern and care” for the people of the state. “Ami laga bhai aru boyni-khan. Aami Nagaland-te matiye karone besi khusi paise dei. (‘My dear brothers and sisters. I am very happy that I have been invited to Nagaland’),” Vajpayee said while addressing the public in Kohima. He announced a four-lane highway between Kohima and Dimapur after experiencing the roller-coaster ride. It’s almost 15 years since he made the announcement. It may take some years before the project is completed but he will be remembered when it is done. 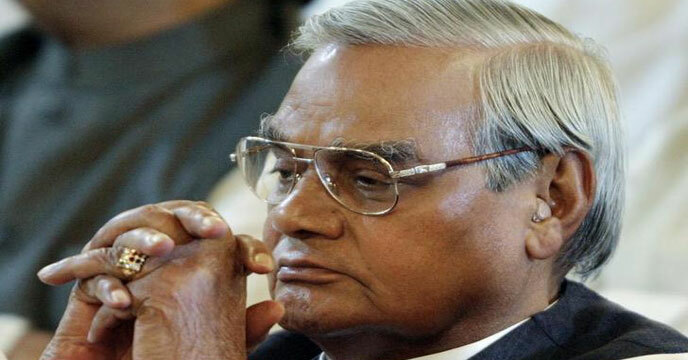 Vajpayee also introduced the BSNL mobile phone service in the state by directly speaking to the then Union Communications Minister Arun Shourie in New Delhi over the phone in the presence of Rio and then Governor Shyamal Datta. “Let the dialogue proceed. Let distances be removed and let confidence be built and let us together create peace and accelerate the development,” said Vajpayee during the launch of the mobile phone service in the state. “It is true that, of all the states in India, Nagaland has a unique history. We are sensitive to this historical fact,” Rio quoted Vajpayee as saying.